A couple of events in the next two weeks. Come along if you can. The first is at Crickhowell Literary Festival – at 7:30pm on October 1st. I’ll be talking to Horatio Clare, or he’ll be talking to me. The second is at Penarth Literature Festival – at 2:30 on October 9th, a date better known for being (son) Edwyn’s birthday. There Oliver Balch and I will be talking to Jasper Fforde, in some combination, with all eyes on the Welsh borders. Actually, now I think of it/ look at the calendar: 7pm, October 13th, Cardiff Waterstones. I’ve been charged with grilling Max Porter about his glorious Grief Is the Thing With Feathers. I’ve always avoided the chairing role before so we will see what comes of that. I only know about reviews if somebody tells me, so there may have been others in the US too shocking to mention, or something, but if nothing else Publisher’s Weekly must be among the first and very nice it is too. And educational. Anapests cut through with iambs, eh? Have a look at this sermon given at Matins on 24th July in Westminster Abbey, which takes Addlands as its starting point. I did, I admit, have to read it two or three times to appreciate it properly – the idea of Addlands being discussed from any pulpit, and then that pulpit, took me a while to get used to – but David Stanton gives a very generous and considered reflection on the book, and his views on the role of the church within a community are deeply felt and, for me, very refreshing. Well, yes, not the Booker Prize… But then Not the Booker Prize too. 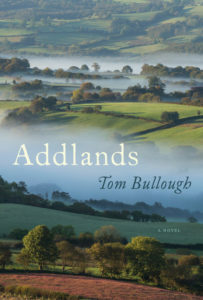 If you are feeling public spirited, please vote for Addlands in the Guardian Not the Booker Prize. Deadline is August 14th. It’s a question of writing something in a comments box at the bottom, by the way. There seems to be some confusion about that. August 3rd, 11am- 1pm: Ar Yr Ymylon/ On the Edge – Christopher Meredith and I will be discussing borders and books and such things in the Cabin of Curiosities, 15 Nevill Street, Abergavenny, NP7 5AA. With beneath it a draft of something new, including the words “of”, “ground”, “intermingling” and “Valley”. This is the trouble with writing the same passages long-hand, over and over and over, making minute changes each time – handwriting becomes a sort of personal code, of no use at all when suddenly you’re called upon to use it in reality. Here‘s an interview I did with Sean Rocks for RTE Arena on Friday. He was in Dublin. I was in a Stasi-era cupboard in Cardiff. Actually that link seems unwilling to comply. Easiest probably to put “Addlands” in the RTE Radio search bar. 3 a.m. review from James Tookey, which points out things I hadn’t noticed, which is saying something given how many thousands of times I must have read it. And Addlands is August choice in The Bookseller, which is great though I don’t have a link for that so I can’t pass it on. It would be nice if there were a picture in this post. I’ll look for one now.